A waterpark feasibility study is generally required by a mortgage lender or investor before a developer or organization considers constructing a new indoor or outdoor waterpark resort and/or outdoor waterpark. Typically performed by an independent third-party consultant who specializes in analyzing the performance of waterpark and hotel projects, a feasibility study determines whether a proposed waterpark development is economically feasible and if the value of the proposed project equals or exceeds the development costs when completed and operational. The feasibility study will analyze revenues, expenses, and net income to determine the value of the proposed project compared to projected development costs. An outdoor waterpark is a facility offering three or more waterslides and other aquatic facilities. An indoor waterpark resort is a lodging establishment containing an indoor aquatic facility with a minimum of 10,000 square feet of indoor waterpark space and inclusive of amenities such as slides, tubes, and a variety of indoor water play features. A standalone indoor waterpark is an aquatic center without an attached hotel, having a minimum of 10,000 square feet, inclusive of amenities such as slides, tubes, and a variety of indoor water play features. A resort hotel with outdoor waterpark is a hotel with three or more water play features, such as slides, lazy rivers, or wave pools that require lifeguards. The area, demographic, and neighborhood analysis evaluates the local economy surrounding the proposed development. The area analysis focuses on the social, economic, governmental, and environmental forces that influence the performance and valuation of a waterpark facility. Demographic information, including population, households, income levels, employment levels, etc., should be reviewed in detail to calculate the number of people and potential customers who live within the local and regional areas. The following are some questions the study should answer. Household growth: How large is the typical household? How many children are there per household? The number of children in the area is a particularly crucial data point since waterparks are family-oriented facilities. Household economics: What is the unemployment rate? What is the median income? How much disposable income do households in the area have? Area economics: Which large corporations are based in the area? Are there tourist attractions in the area? When answering these questions, a consultant will look for existing demand generators as well as potential demand generators that are in the development stages or those that may be leaving the market soon. Area transportation: The number of airports, interstate highways, and rail stations greatly affects travel to an area. A neighborhood analysis of nearby commercial and tourist establishments is important since successful waterpark projects are typically located in areas with complementary real estate uses. The most successful indoor waterpark resorts are located near other major tourist attractions that draw overnight visitors. The most successful outdoor waterparks are typically located in areas where both local residents and tourists want to go and may be located near major retail outlets, beaches, or community facilities. The site review evaluates the subject parcel’s size, access and visibility, topography, availability of utilities (including water and sewer), and other site related attributes necessary for a successful waterpark project. The waterpark’s proximity to leisure guests is an important consideration since waterpark visitors appreciate convenient access from area highways. Our firm typically analyzes a drive time or mileage radius and estimates the number of available youths and adults within a 30-, 60-, 120-, and/or 180-mile (or minute) ring from the subject property. We obtain the demographic data from sources such as Claritas or ESRI. The study should compare the number of youths and adults within specific drive times from the subject site with other successful waterparks (indoor or outdoor) that are located in different locations throughout the United States to determine whether the subject site has an adequate population base. The following are some questions the study should answer. Drive time demographics: What are the population and household income levels within various drive times of the subject property, and how does it compare with locations such as Wisconsin Dells, Sandusky, Orlando, or other markets that have successful waterpark resorts? Site: Is the site large enough to support the planned waterpark project? Is there room for future expansion? Amenities: Are there nearby amenities that would support the proposed project? Governmental impacts: How do the subject’s ad valorem taxes, zoning, sales history, governmental restrictions, environmental regulations and other factors affect the subject property? The consultant should review plans for the facility, the scope of the development and projected costs. Some clients provide the consultant with their development plans, which are then reviewed so the consultant can recommend changes and appropriate improvements. Other clients request that the consultant recommend the scope of the development based upon their market research for the feasibility study. For an indoor waterpark resort, the scope of recommendations includes the number of guestrooms, size of indoor waterpark, rides and attractions, size of outdoor waterpark, number of restaurants and lounges, amount of meeting space, size of gift shop and arcade, and other amenities to include. For an outdoor waterpark, the scope of recommendations includes the size of the outdoor waterpark, rides and attractions, food and beverage outlets, size of gift shop and arcade, and other amenities to include. The consultant may estimate a range of costs for the proposed development based upon recently constructed waterpark projects, or the client may hire an architect and/or engineer to perform a formal cost estimate for the proposed development. The following are some questions the study should answer. Physical plant information: Have any architectural plans been developed by the client? Facility size: How large should the project be? How many rides and attractions should the waterpark offer? How many guestrooms should the hotel offer? How many food and beverage facilities within the hotel and waterpark? Branding: For an indoor waterpark resort, should the hotel have a franchise affiliation? Theme: What type of theme should the waterpark have? How elaborate should the theme be? A thorough market analysis of the local and regional hotel and indoor waterpark resort or outdoor waterpark market is essential. The projections of financial performance for the project will depend heavily upon the data gathered. Typically an indoor waterpark resort will attract primarily overnight guests with some local users while an outdoor waterpark will attract primarily local users with some overnight guests. In preparing a study for an indoor waterpark resort, the consultant should analyze occupancy, average daily rate (ADR), and revenue per available room (RevPAR) of a market area. A hotel market report from STR and performing interviews with management of competitive hotels will help the consultant gain a greater understanding of the state of the hotel market. Additionally, the consultant should identify all new hotels that are proposed, under construction, and in development that could compete with the proposed resort project. For an outdoor waterpark analysis, the consultant would want to analyze the performance of hotels in the market, but there is less emphasis on overnight guests in this type of project. The following factors are critical to the market analysis. Existing competitors: How many existing competitors are in the market and to what degree are they competitive in terms of amenity offerings, affordability, etc.? How have they performed in past years in terms of occupancy, ADR and RevPAR? Existing indoor waterpark resorts: What existing indoor waterpark resorts exist within the region and what is their occupancy and ADR performance? Demographic analysis: How many indoor waterpark resort rooms exist within a reasonable drive of the proposed subject on a per household basis compared to competitive locations? Recent hotel openings: How many hotels have opened in the past few years and what impact have those openings had on the market? Potential hotel openings: How many hotel projects are in the works? What types of hotels will they be? How many rooms will they have? What is their projected impact on the current supply and demand situation in the market? Market segmentation and market penetration: What is the market segmentation and penetration of each competitor in the market? The consultant will want to look at all market segments, but give special attention to the leisure market. Hotels in the area that garner the largest share of the leisure market will be the subject property’s biggest competitors. Projections: Synthesize the data gathered about and project the performance potential for the subject property. Based on the current market situation, is the subject likely to perform well in terms of occupancy and ADR? What are its potential penetration rates and market segmentation? An analysis of the existing indoor and outdoor waterparks’ attendance and pricing is very important. The consultant will need to do thorough research of a variety of published sources as well as interviews with managers of the various waterparks to determine the number of attendees, average prices, and total revenues at the comparable properties. In some cases, waterpark managers are unwilling to share this information, and there is no STR type organization that tracks waterpark attendance. Our firm consistently collects waterpark performance data that is maintained in our proprietary database. Below are things to consider. Existing and potential competitors: How many indoor and outdoor waterparks are in the area? How many are proposed? Attendance: How are existing waterparks performing in terms of attendance and usage? Demographics: What is the population for a 20-, 40-, and 60-minute drive around each competitor on a per attendee basis compared to the subject site? Amenities of competitors: To what degree will existing and potential waterparks be competitive in terms of size, amenities, pricing, theming, etc.? Waterpark pricing: What are the rack rates for the competitive waterparks? What is the average ticket price per attendee at the competitive properties? For an indoor waterpark resort, the focus should be on other indoor waterparks attached to hotels. For an outdoor waterpark, the focus should be on existing outdoor waterparks. For indoor waterpark resorts, the hotel is the key driver of operating performance for the property. In estimating the performance of a hotel, the study will project the number of occupied rooms, ADR, and usage levels for the hotel property. A detailed supply and demand model that calculates the historical performance of the market and makes projections for the subject property should be presented. The potential number of day pass users for the indoor waterpark should also be calculated through analyzing the number of overnight guests versus capacity for day pass users. The following are some questions to consider. Occupancy and ADR: What is the historical and projected performance of the competitive set of hotels in the market? How will the subject property penetrate the existing demand in the commercial, group, and leisure segments? What is the projected ADR by segment? Does the projected ADR include usage of the waterpark? Demand: What is the projected performance of the subject property? How plentiful are demand generators in the area? What is the regional population of families with children who might visit the waterpark resort? Day passes: Will the subject allow for day passes? Indoor waterpark resorts are split between those that allow for day passes and those that require guests to stay overnight since it encourages them to utilize the other amenities of the resort hotel. Projections: Based on the data gathered, how many waterpark visitors can the subject property expect, and will these visitors come from the subject hotel, nearby hotels, or will they be local residents? Pricing: What is a reasonable waterpark admission charge for non-overnight guests? For outdoor waterparks, the key figures to estimate include the number of attendees and the average ticket price. Outdoor waterpark attendance varies depending upon location, pricing, amenities, attractions, number of rides and slides, size, weather, and marketing efforts. The study should thoroughly analyze each of these major issues. The pricing for outdoor waterparks will heavily depend upon the investor’s criteria. Many municipally owned outdoor waterparks charge much lower prices since they will not have to pay debt service and are taxpayer-funded, while most privately owned outdoor waterparks try to achieve the highest possible prices to provide sufficient funds for payment of debt service and investor profit. The following are some questions to consider. Usage: What are the historical and projected usage levels and pricing of existing waterparks and amusement parks within the region? Facilities: How does the subject property’s proposed facilities, location, and size compare to the existing properties? Population: What is the population base within a 30- to 60-minute drive radius around the subject property, and how many youths are in the area who would potentially utilize the proposed waterpark during the season? Pricing: What will the pricing be for season passes and day passes? Projections: Based upon the data gathered, what type of attendance levels will the subject achieve for the first five years of the analysis? What type of pricing levels are reasonable considering the proposed attendance levels? Weather: How many days per year are over 80 degrees Fahrenheit? How many rainy days typically occur during these warm weather days? The financial analysis estimates a property’s capacity to generate income and makes financial projections for the property. Estimating annual operating results for the subject property involves an analysis of the subject’s scope and characteristics compared with comparable properties and industry standards. The general steps include the following. Estimate the potential gross revenues for the subject property based upon an examination of the prior operating history of the subject property (if available), operating history of comparable properties in the subject market area and on a national basis, and an analysis of industry trends. Analyze departmental, undistributed, and fixed expenses, and project appropriate amounts in each category. For example, staffing and labor costs are critical components of operating an indoor or outdoor waterpark. Project the resultant net operating income (cash flow before debt service) over an appropriate holding period. 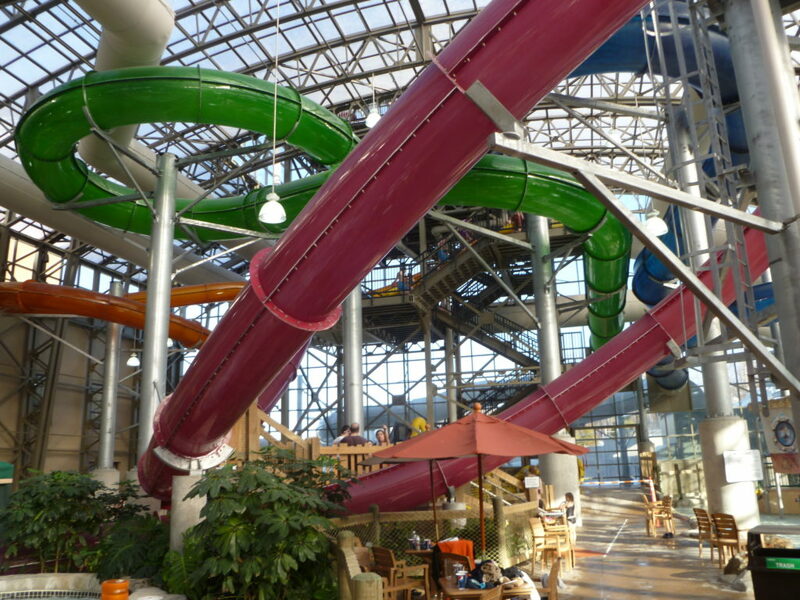 The economic value of an indoor waterpark resort or outdoor waterpark is calculated through a discounted cash flow analysis. 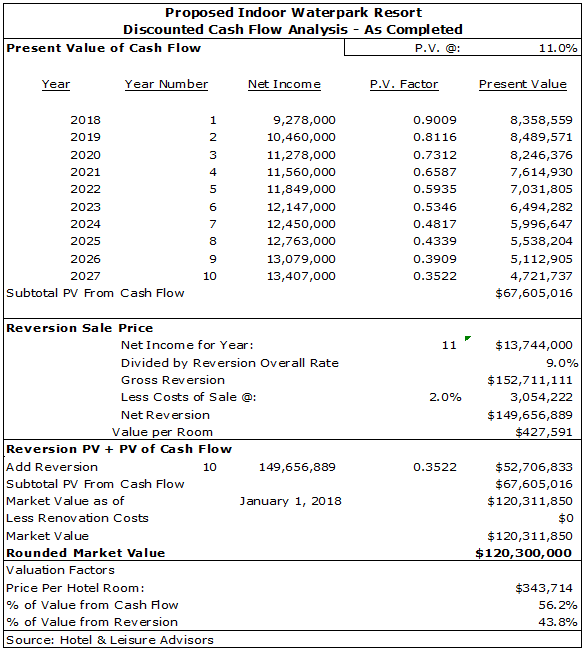 This analysis utilizes the property’s projected net income before debt service and applies a discount rate and terminal capitalization rate to determine the valuation. This is a common method utilized in a formal appraisal process. The discount rate is the average annual rate of return necessary to attract capital based upon the overall investment characteristics. The terminal capitalization rate is applied to a future year’s net income to calculate a potential sale price for the property in the future. Presented is an example of an analysis performed for a 350-room indoor waterpark resort. The key component of a feasibility study is to determine if the projected value created as shown from the discounted cash flow analysis equals or exceeds the development cost for the proposed project. A feasibility study should present the projected value created after a detailed analysis of the factors that determine success of the proposed properties. In some cases, detailed costs will not be available, and this conclusion will be determined after the client has cost estimates performed by building contractors and architects. In other cases, the client has estimates of construction costs, and the feasibility study will present these estimates and compare the value created to the development costs to determine if the project is feasible. The most viable projects, which have the greatest investor appeal, are those in which the value created is greater than the development costs for the proposal. Even if the value created is less than the development costs, the project may still be feasible if the project can attract municipal incentives such as a tax abatement or capital assistance to the developer in terms of infrastructure. This would allow for either improved financial projections or for lower development costs. Conclusion: The feasibility study of an indoor waterpark resort or an outdoor waterpark requires analysis and expertise beyond other types of commercial real estate. An indoor waterpark resort feasibility study requires a thorough market analysis involving a study of the economic and demographic factors as well as a review of the hotel and indoor waterpark resort markets. An outdoor waterpark feasibility study requires the same market analysis and also requires additional analysis of the outdoor waterpark and amusement park markets. Both studies require a complete financial analysis, which looks at various revenue and expense categories. The purpose of the feasibility study is to provide honest and reliable information to the client to help them decide whether to develop the waterpark project. Author: David J. Sangree, MAI, CPA, ISHC is President of Hotel & Leisure Advisors, a national hospitality consulting firm. He prepares appraisals, feasibility studies, impact studies, and other consulting reports for hotels, resorts, waterparks, golf courses, amusement parks, casinos, conference centers, ski resorts and other leisure properties. He has performed more than 2,000 hotel studies and more than 400 indoor and outdoor waterpark resort market feasibility and/or appraisal studies across the United States and Canada. Mr. Sangree received his Bachelor of Science degree from Cornell University School of Hotel Administration in 1984. He became a certified public accountant in 1989, an MAI member of the Appraisal Institute in 1995, and a member of the International Society of Hospitality Consultants in 1996. He can be reached at 216-810-5800 or dsangree@hladvisors.com.